The American Regions Mathematics League's annual competition brings together the nation's finest students. They meet, compete against, and socialize with one another, forming friendships and sharpening their mathematical skills. Since its inception in 1976, ARML has snowballed, burgeoned, and mushroomed into a national program, involving almost 2000 students and teachers from almost every state. 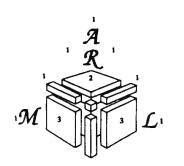 Simply put, ARML is the World Series of mathematics competitions. The competition consists of several events, which include a team round, a power question (in which a team solves proof-oriented questions), an individual round, two relay rounds (in which a contestant solves a problem and passes his/her answer to another team member, who uses this answer to solve another problem), and a super relay. In all, about 120+ teams will participate. A team consists of 15 students, high school age or lower. The competition takes place the weekend immediately following Memorial Day. Most teams arrive on campus Friday afternoon, stay in University dorms, and leave the day after the competition. The competition begins early Saturday morning at Penn State, the University of Georgia, and the University of Iowa, and in the early evening on Friday at UNLV. Teams of students solve mathematics problems on various topics in four rounds to earn points and advance into higher levels of the competition. The scoring structure of the contest will be as follows.